What's better than a beautiful princess dress? Nothing. Nothing is better! This gorgeous pink dress will instantly be your daughter's favorite. 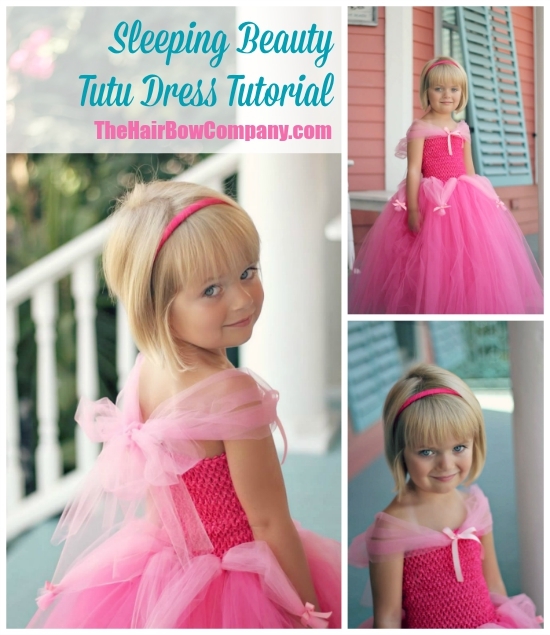 Use it as a Sleeping Beauty costume, a Barbie-inspired costume, or just for dress up fun! Decide how long you want your dress. I wanted mine to be about 24" long. To make a dress that is 24" long, you need strands of tulle that are 48" long. I like to find a flattened 24" box, wrap a spool of tulle around it, and then cut one end. This leaves me with a stack of 48" strands of tulle. You're going to repeat that a few times, but let's just start with the first roll. Grab your crochet headband. If you've never done this, these steps will sound confusing. The photos below should clear it all up. Find a hole on the bottom of the headband. Don't choose the last row, choose the second to last row. Your knot will be around a square on the last row. Push your crochet hook up and out through that hole. Pay attention to the picture. If you do it the way I show you, your tulle will lay nicely and all of your knots will look identical. So your crochet hook is pushed up through the hole in the headband. 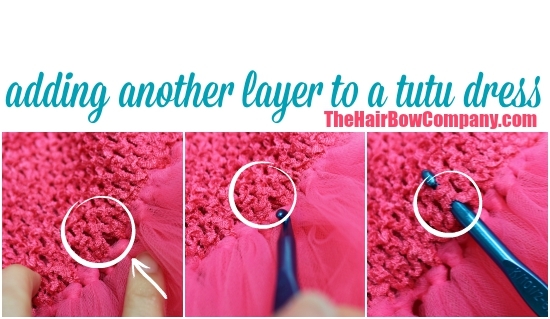 Take a strand of tulle that is folded in half (a 48" strand that is folded to be 24") and hook it onto the crochet hook. Pull it down through the hole and out the bottom of the headband. Now take the ends of that tulle strip and pull them down, through that loop in the tulle. And pull to tighten the knot. Don't pull too tight... I've actually ripped a piece of tulle that way. Does it look wonderful? Good. Now add another. And another. And another. And go all around the dress. Adding the second layer is easy. Just go up a row and attach the tulle. I get questions on this step ALL THE TIME, so here are some pictures to show you exactly what to do. 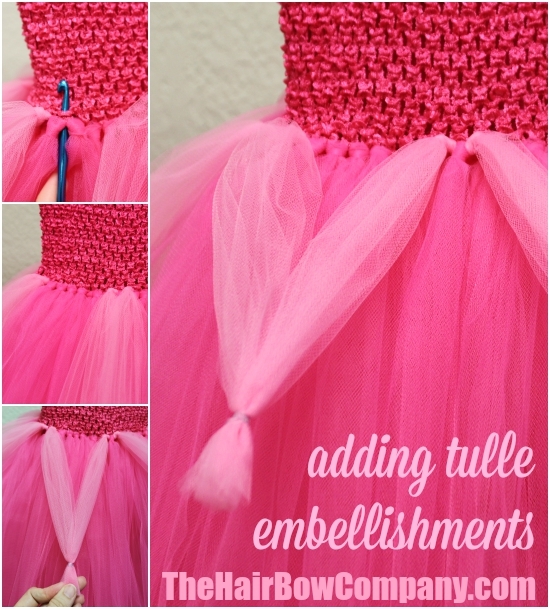 Once you have all of your tulle attached, you can embellish the dress. Do it however you'd like! Add colors and drapes of tulle to match your favorite princess. I chose to add some lighter pink embellishments around the waistline. Usually when I add "extras" to a dress, I just play around until I come up with something I like. That's precisely what I did here. You may come up with another way to do this, and that's just fine. I attached strands of light pink tulle around the dress. Two strands, then skip about 7 holes, then two strands, etc. Then I pulled the strands together to make V shapes and banded them together. I added little light pink bows to cover up the rubber bands. For the off-the-shoulder straps, I took 4' three strands of tulle and thread them through a center hole on the front of the dress. Once the dress was on the model, I tied them in the back. I honestly wasn't expecting much out of this dress since it seemed very basic. I ended up LOVING it. The pinks are gorgeous and the fluff is so much fun! Looking for more tutorials? Check out our Costume Making Guide! If you have any questions while crafting your dress, feel free to get in touch with me at ruffles@thehairbowcompany.com.